A new tri-generation system will be installed at Canterbury Hurlstone Park RSL Club, reducing energy consumption by 15 per cent and energy bills by $190,000 annually. Canterbury Hurlstone Park RSL Club will receive almost $600,000 from the Federal Labor Government for their tri-generation system. 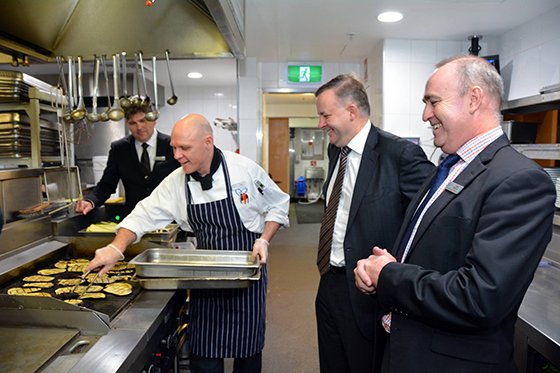 Member for Grayndler, Anthony Albanese said he was proud the government is providing funding for this important project. “This is a smart project – it is about using new technology to help the Club be more energy efficient and save money, but it’s also smart because the Club’s 30,000 members and other community organisations will learn from this experience,” he said. “It’s estimated the Club will reap energy savings of $190,000 annually which can then be reinvested into other important community services. “Just last month, I opened a similar cogeneration plant at Leichhardt Park Aquatic Centre. These projects demonstrate yet again the innovation taking place since the introduction of the carbon price. Generate electricity for use by the Club avoiding the use of expensive peak and shoulder grid supplies. “Waste heat” will also be used to heat water for use within the club and pre-chill water going to the Club’s electric chillers. The tri-generation system will feed the club’s hot water systems, space heating and air-conditioning. Funding will be provided through the Community Energy Efficiency Program. The project is expected to be completed early next year.